Will get you more fee. There must be fifty ways to fix your data. In exploring a dataset, you need to be sure that you have the right numbers and that those numbers are right. You need to find and fix problems with individual data points like errors and outliers. You need to find and fix problems with observations like censored data and replicates. And you need to find and fix problems with variables like their frequency distributions and their correlations with other variables. Often, rehabilitating variables involves transformations, methods of changing the scales of your variables that might further your analyses. As part of this process, you should consider what other information you can add that might be relevant to your analysis. This is especially important if you are planning to develop an exploratory statistical model. Experience will tell you when expanding your dataset might make a difference and when it won’t. If you don’t have that experience yet, start by learning about why you might transform variables and how it can be done. Then practice; try a variety of different techniques and learn along the way. But first you need to understand some of the pros and cons of what you might do to your dataset. Analyze what you measure. Don’t complicate the analysis unnecessarily. Stick to what the instrument was designed to measure in the way it was designed to measure it. Use scales consistently. Don’t confuse your readers unnecessarily. Report results in the same units that you used to measure the data. Let the data decide. Don’t capitalize on chance by overfitting your model. Your results should work on other samples from the same population. There is a single simple argument for the use of transformations—they work better than the original variable scales. If they don’t work better, you don’t use them. William of Ockham would have liked that argument. So what constitutes working better? Consider these examples of the three ways that transformations are used. One, perhaps the most important use of transformations is to reduce the effects of violations of statistical assumptions. If you plan to do any statistical analysis that involves using a Normal (or other) distribution as a model of your dependent variable, it’s important to use a scale that makes the data fit the distribution as closely as possible. If the data aren’t a good fit for the distribution, probabilities calculated for some tests and statistics will be in error. Because costly or risky decisions may be made from these probabilities, inaccuracies can be a big deal. So using a transformation to correct violations of statistical assumptions is a very important use. 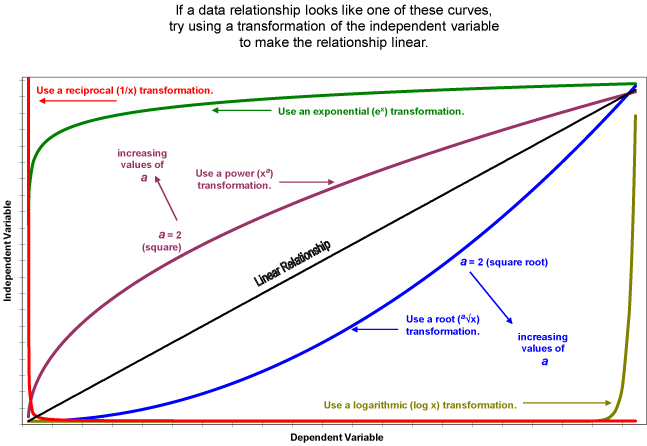 Two, perhaps the most common use of transformations is to find scales that optimize the linear correlation between data for a dependent variable and data for independent variables. Statistical model building almost always benefits from this use of transformations. Everybody does it. Three, perhaps the most overlooked use of transformations is, in a word, convenience. Sometimes transformations are used to convert measured data to more familiar units, improve computational efficiency, eliminate replicates, reduce the number of variables, and other actions that facilitate, but not necessarily improve, the analysis. Sample Adjustments—methods for fixing missing, erroneous, or unrepresentative data points. Dependent Variable Transformations—methods for changing the scale of the dependent variable to minimize the effects of violations of statistical assumptions. Independent Variable Transformations—methods for creating new variables from the original independent variables, which have better correlations with the dependent variable. 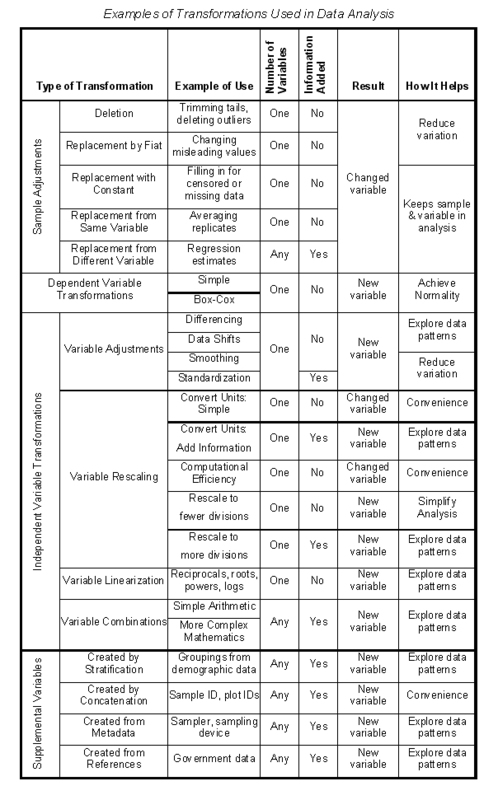 Supplemental Variables—methods for creating new variables from untapped data sources. There is nothing sacred about this classification. Some of the categories might overlap or omit other ideas, so use these examples to stimulate your own thinking. In time, you’ll develop a sense of what you need for a particular analysis. Sample adjustments involve changing individual data points for a variable. Unlike most transformations which result in the creation of a new variable, sample adjustments leave the original variable intact. You use adjustments to correct errors, fill in missing data, reveal censored data, rein in unrepresentative replicates, and accommodate outliers. Using sample adjustments is a good place to start enhancing your data set. They are like digging out weeds and filling in holes before you plant a new lawn. It wouldn’t make sense to do it later, or worse, not at all. After you’ve filled all the holes in your data matrix with sample adjustments, the next thing you should do is to make sure the dependent variable approximates a Normal distribution. If you haven’t looked at histograms and other indicators of Normality, always do that first. Then if your data distribution differs enough from the Normal distribution to make you nervous about your analysis, try a transformation of the dependent variable. Try several, in fact. Transformations of dependent variables create new variables but you’ll keep only one of the candidate dependent variables for an analysis. You want to pick the candidate dependent variable that fits a theoretical distribution best so that calculations of test probabilities are most accurate. If the frequency distribution of your dependent variable is skewed toward higher values, try a root transformation. If the frequency distribution is skewed toward lower values, try a power transformation. Better yet, try a Box-Cox transformation. Box-Cox transformations include the most commonly used transformations—roots, powers, reciprocals, and logs—as well as an infinite number of minor variations in between. The only downside is that the process is labor intensive if you don’t have statistical software that performs the analysis. Once you have the dependent variable you want to work with, you can go on to examine all the relationships between that dependent variable and the independent variables. While the target for transforming a dependent variable is the Normal frequency distribution, the target for transforming independent variables is a straight-line correlation between the dependent variable and each independent variable. This can be a lot of work. Remember, you have to look at correlations and plots, perhaps even for special groupings of the data. That’s the reason you always start by finding a scale for the dependent variable that fits a Normal distribution. You wouldn’t want to repeat this process for more than one dependent variable if you didn’t have to. Differencing. Differencing involves subtracting the value of a variable from a subsequent value of the same variable, usually used to highlight differences. Durations in a time-series are calculated by differencing. Smoothing. Smoothing is the opposite of differencing and usually involves some type of averaging. Smoothing is used to suppress data noise so patterns become more evident. Shifting. Data shifting involves moving data up or down one or more rows in a data matrix to produce new variables called lags (when previous times are shifted to the current time) or leads (when subsequent times are shifted to the current time). Shifting all the data by one row is called a first-order lag or lead. Shifting data for a variable by k rows is called a k-order lag or lead. Standardizing. Standardizing involves equating the scales of some variables, usually by dividing the values by a reference value. Examples include adjusting currency for inflation, and calculating z-scores and percentages. differencing, data shifting, smoothing, and standardizing. Changing the scale of a variable is different from changing the units of a variable. Both are important. Changing units usually involves only simple mathematical calculations with or without the addition or deletion of information. Rescaling variables involves adding or removing information or changing a point of reference. Rescaling usually involves making changes based on logic but may include mathematical calculations as well. Recoding is perhaps the most common way of rescaling a variable. Some statistical software have utilities to facilitate recoding. Improving the correlation between a dependent variable and an independent variable is a big part of statistical modeling. The objectives of this type of transformation are (1) to persuade the data to follow a straight line, and (2) minimize the scatter of the data around the line. Here are a few examples of mathematical functions used as transformations. Variable combinations are new variables created from two or more existing variables using simple arithmetic operations (sums, differences, products, and ratios) or more complex mathematical functions. Variable combinations should be based on theory rather than created for convenience. Usually the variables combined should have the same units (e.g., dollars), although units can be standardized using z-scores. You won’t necessarily just add variables at the beginning of your analysis. You may add them continuously throughout your analysis as you learn more about your data. Some variables may turn out to be critical to the analysis and others will just facilitate reporting or some other ancillary function. Supplemental variables can be creating by concatenating or partitioning existing variables, or by adding new information from metadata or external references (e.g., federal census data). When your instructor gave you a dataset in Statistics 101, that was it. You did what the assignment called for, got the desired answer, and you were finished. But it doesn’t work that way in the real world overflowing with data but lacking in wisdom. Sometimes you have to put more effort into making sense of things. Statistics is the mortar that brings data and metadata together to make building blocks of information into a temple of wisdom. Transformations are like mason’s tools. They can smooth, reshape, adjust, add texture, augment, condense, and on and on. Suffice it to say that with transformations, there must be at least fifty ways to fix your data. This entry was posted in Uncategorized and tagged Box-Cox, cats, correlation coefficient, differencing, information, lags, math, measurement, measurement scales, model, Normal distribution, recoding, rescaling, smoothing, software, standardization, statistical analysis, statistics, stats with cats, transformations, trend. Bookmark the permalink. I post a blog every Sunday at https://statswithcats.wordpress.com/. 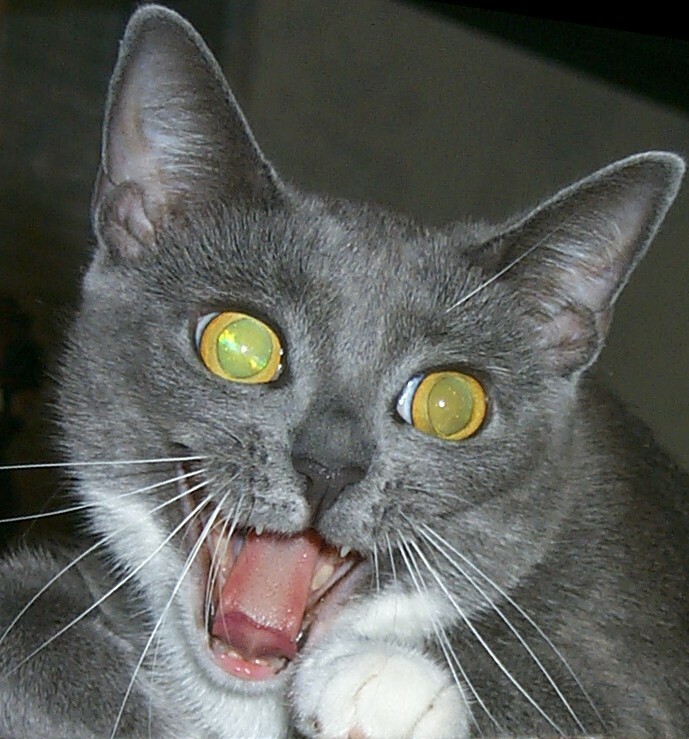 Most of the blogs are excerpts from a book, Stats with Cats, that I will be publishing later this year. I love browsing your blog because you can always get us fresh and cool stuff, I feel that I ought to at least say a thank you for your hard work. Pingback: How to write data analysis reports. Lesson 1—Know Your Content. – Big Data Made Simple – One source. Many perspectives.